One of the many brilliantly coloured species, Heliconia wagneriana with its colourful flowers is sought after both for the garden and as a cut flowers. Also known as the ‘Rainbow Plant, this is a ‘Lobster Claw’ Heliconia and very attractive. Variable in colour, the best examples have brilliant red to pink cheeks, bordered with yellow and with a lime green margin on each flower bract. Originally from tropical areas, this is a species that will grow in sub tropical climates as well. In cooler areas a hot house will be be required. Foliage is a deep green and attractive. Originally from Central America, and sometimes called the ‘Rainbow Heliconcia’ this is a stunning addition to any tropical garden. 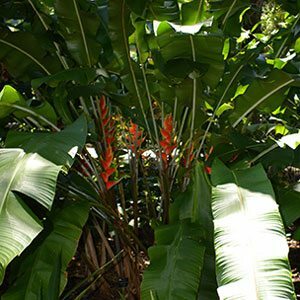 Best grown in full sun to part shade, like many plants it will grow taller in shade than in sun. A humus rich moist and well drained soil is essential, and although this is a species that will tolerate some frost, protection is recommended. A humid environment is required and annual applications of mulch to help retain moisture and a cool root run is also recommended. If you are growing this plant from a rhizome, you need to plant the rhizome at around 5 cm deep, any deeper can cause problems. From planting the rhizome to flowering will take between 1 and 2 years. Flowers are long lasting and need to be picked when fully open as they will not open after picking. The easiest method of propagation is by dividing established clumps, this is best carried out while the plant is not in active growth. It is also possible to propagate the plant from seed. 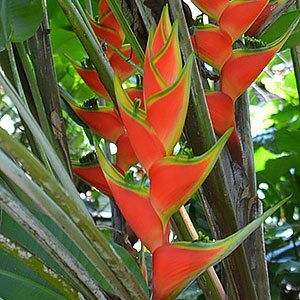 Botanical Name – Heliconia wagneriana. Flowers – Red with yellow and green.